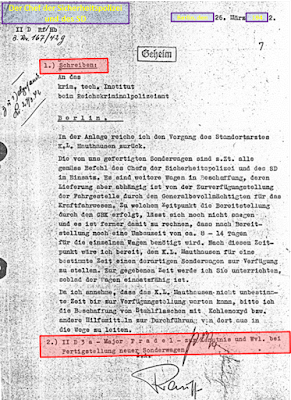 On 26 March 1942, the head of Technical Department of the RSHA Walther Rauff informed the Criminal Technical Institute of the Security Police that "the special vans manufactured by us are at this time in operation...I request that you use steel bottles with carbon monoxide or respectively other remedies to get things started" in concentration camp Mauthausen (document 4 here). The letter strongly supports the construction and use of homicidal gas vans by the German paramilitary forces. As usual, the document is dismissed as forgery by Holocaust deniers, yet none of the arguments brought forward by Santiago Alvarez actually supports this hypothesis. a) The name of the sending authority (RSHA) is not given. c) Giving initials of the author (Rf) and of the secretary (Hb) was not practiced on any of the other RSHA letters in this file. d) The letter’s serial no. “167/42g” is handwritten, not typed. g) The paragraph starting with “2. )” was typed (squeezed in over the “I.A.” line) after the paper had been removed from the machine, resulting in it being shifted and slightly rotated. h) Since it does not belong to the other documents of this file R 58/871f°1, somebody must have put it there on purpose. i) Friedrich Pradel was not a major but rather an SS-Hauptsturmführer (equivalent to a captain). But he is making it way too easy for himself when he wants to "leave it up to the reader to decide whether that has any relevance". After all, it's him who is writing a book on German gas vans and it's him advancing the insinuation that this letter is a post-war forgery. So it is also up to him to explain how relevant his items are connected to his postulate that "this document was created for the Nuremberg trial". It's not his readers' job to guess this. Indeed, on a closer look all items lack any relevance whatsoever to support his forgery hypothesis. The document lacks half of the usual entries in a letterhead (Alvarez' items a, e & f) as if the person typing the document was lazy or in a hurry. But these missing entries are precisely what was contained on a preprinted sheet of writing paper in the RSHA, e.g. see this letter from Heydrich (to my knowledge, this observation was first pointed out by ANTPogo aka A'isha at the International Skeptics Forum). So the document is obviously a carbon copy of the letter containing only what the clerk actually typed into the letterhead. This finding also well explains Alvarez' item g. After the letter was typed, the carbon copy was inserted again into the typewriter to add the itemisation of the first part as well as the entire second item, which were both office internal features lacking on the original letter sent to the Criminal Technical Institute. Because of the removal from the typewriter after the letter had been typed, these later additions are somewhat shifted to the right as well as rotated anti-clockwise compared to the rest of the text. Carbon copy by Rauff's office of his letter to the Criminal Technial Institute of 26 March 1942. The blue boxes with exemplary yellow text indicate printed text expected on the stationery necessarily lacking on the copy. The red boxes mark text of the internal office process added to the copy and lacking on the original letter. The same practice of producing a carbon copy of letters with incomplete letterhead or additional text for the own files can be found in documents from the German foreign office, e.g. Eichmann trial exhibits T-37 (77) and T-37 (89). The document has the typed initials of Rauff and the RSHA clerk preparing it in the letterhead (item c), something which was not practiced for the known documents from the department. However, there are only few sources that can be taken as reference. There are no more than 3 relevant memos and letters in the file R 58/871 not declared forgery by deniers (and one more claimed as forgery). That's an insufficient set of data to decide if this is truly an anomaly, or if both variants were accepted routines and possible in Rauff's office. The style of the document (listing and enumeration of items to be tracked down with the final process "resubmission" of the document, style of the registration number) is sufficiently close to the other docs in the file to suggest that the supposed Allied forger had an authentic original document available as guideline. But if the initials were an anomaly lacking on the original, why did he add it to the forgery? Conversely, if he lacked an original and added the initials out of ignorance, it can not longer be explained why he matched the style of this type of documents so well. In short, the forgery hypothesis is only a poor explanation even if the initials were an anomaly. On the other side, it is at least conceivable that as exception to a routine the clerk thought to clarify that he typed the document. Hence, this feature is more likely explained by that the document is authentic rather than a forgery. Other points raised by Alvarez are either unfounded (items b, d) or irrelevant (item h). Alvarez claims that "The name of the sending office is incomplete: Instead of 'II D 3,' it only states 'II D.'". Ironically, Alvarez has it wrong himself, since Rauff's subordinate Friedrich Pradel's office was actually "II D 3 a". But the person responsible for the letter, Rauff himself, was indeed in charge of II D. Since he was writing to another RSHA office (V D, the Criminal Technical Institute), it is entirely possible - if not likely - that this process was registered directly in his own office and not the level down in Pradel's. Alvarez complains that the registration number of the document is "handwritten, not typed", but this is most likely because the clerk didn't know yet where to put the file when the document was created and typed. And that the document is stored together with those from another file in the Bundesarchiv does not suggest a forgery either. "The deputy of Rauff was Pradel, at the time Hauptmann and later Major. Pradel also had an equivalent SS rank, but he called himself Major." "Sergeant Hünecke from Hannoversch-Münden, who was evaluating accidents in my department in the RSHA during the war, can bear witness that I always gave Major of the Police as my rank until the end of the war. Furthermore, Fähnrich can testify that I wore the uniform of the Major of the Police next to the uniform of the SS-Sturmbannführer of the Waffen-SS until the end." "As I know him [Pradel], he wore the green police uniform with SS runes on the left breast side." The signature on the document corresponds to that of Rauff. 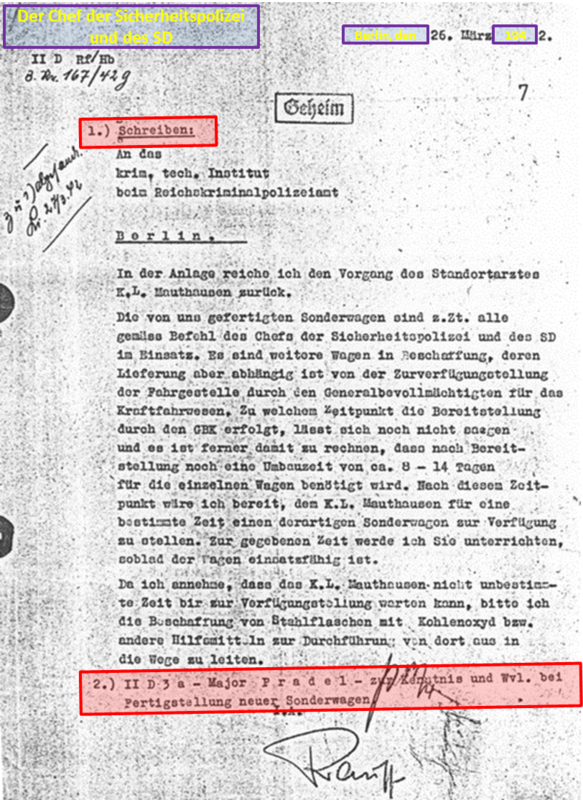 In addition, the second item was counter-signed by Pradel, note his characteristic P. During his interrogation of 13 December 1960, Pradel claimed that the process in the document "is not known to me" and that he doesn't recognize the signature as his own (Bundesarchiv B162 / 5066, p. 256). However, he didn't remember any other documents in the file either, including those accepted as authentic by Revisionists. He explained his lack of memory with accidents he had in April 1944 and 1945. Later, at his own trial, Pradel confirmed that the document was submitted to him at the time (Justiz und NS-Verbrechen, volume 23, p. 622). "Considering that the Saurer special vehicles with their Diesel engines and low cargo boxes could not have served as mobile homicidal gas chambers, it would be interesting to know what the original request was for – if it ever existed." There is no evidence that these Saurer special vehicles mentioned in the document were Diesels. But there is sufficient evidence to conclude that the homicidal gas vans - including those with Saurer chassis - were using gasoline engines and could have served as mobile homicidal gas chamber killing with carbon monoxide. It is likewise false that the cargo box with its height of 1.7 m could not have been meant and used for the gassing of people. Without (optional) grates, most of the victims could have probably stood straight in the cargo box, while most of those > 1.7 m could have stood with back and neck somewhat bent. Aside, the victims could have sat on the floor. In practice, the available inside height was somewhat lower since there was a grate on the floor. It is easily explained why the Germans did not use a bigger cargo box for their gas vans. The height was actually limited by railroad regulations to enable easy transport of the vehicles by rail. This is borne out by the memo of 27 April 1942 according to which "lifting the vehicle coachwork is impermissible, because this would exceed the railroad loading profile". This logistic advantage obviously outweighed that some of the victims would not feel too comfortable in such a box with its low ceiling. The only formal oddities in the document seem to be the initials of author and typist, but the available data set is insufficient to establish even this, let aside that it is rather in favour of its authenticity than the opposite anyway. The other formal points raised by Alvarez are either false, unfounded or irrelevant. The fact that Pradel was properly addressed by his Major despite being in the RSHA with an equivalent SS rank demonstrates that the author possessed extensive insider knowledge. On the content of the document Alvarez has nothing to say other than two patently false assertions. Thus, there is no evidence to support his forgery allegation. Furthermore, Alvarez fails to provide a sound explanation for the supposed forgery. 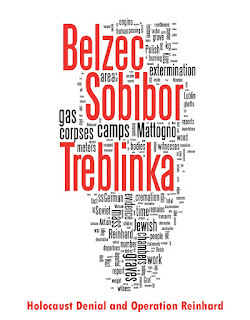 He suggests that the document was "created...to get some documentary 'corroboration' for the – obviously false – gas van claims made by Hans Maržálek" (Alvarez, The Gas Vans, p. 298). 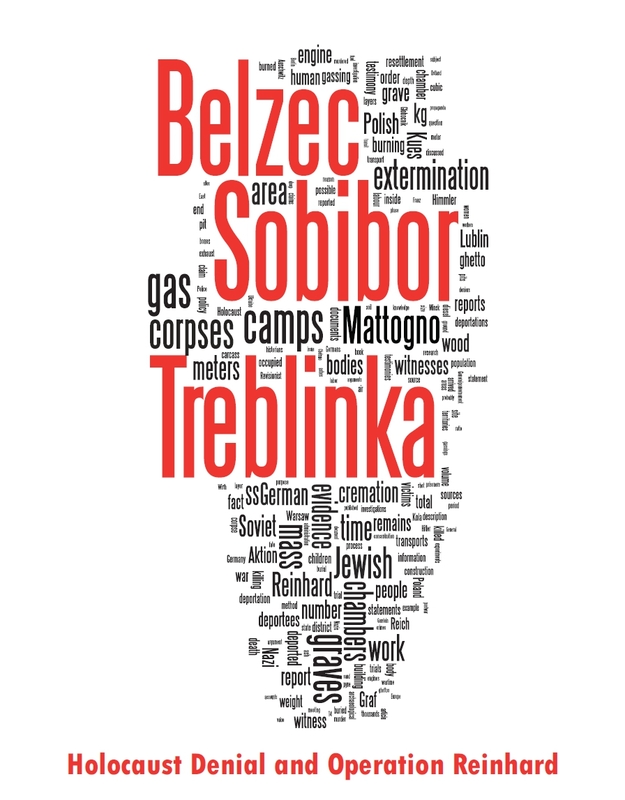 In his deposition of 8 April 1946, Maržálek stated he was told by the Mauthausen camp commandant Franz Zieraus that "a specially built automobile commuted between Mauthausen and Gusen, in which prisoners were gassed while travelling. The idea for the construction of this automobile was Dr. Wasiczki’s, SS-Untersturmfuehrer and pharmacist." Yet, the document in question states that the "special vehicle" could not be delivered to Mauthausen and that they should use CO bottles instead. Moreover, it mentions nothing about the gas vans being an idea of Wasiczki but puts the RSHA in Berlin in charge of them. Last but not least, the document in question does neither really incriminate anybody charged by the Allies (it only mentions the Mauthausen garrison doctor, but doesn't even identify him by his name Eduard Krebsbach and leaves it open if any homicidal gassings were actually carried out in Mauthausen) nor did this particular statement of Maržálek, so what would have been the point of this creation anyway? The process described in the document is entirely plausible from what is known from other sources. According to the letter, the concentration camp Mauthausen requested a homicidal gas van from the KTI (Criminal Technical Institute). The KTI had previously tested a gas van in concentration camp Sachsenhausen (Beer, Die Entwicklung der Gaswagen, English translation), via which Mauthausen might have learnt about their existence and who brought it there. The KTI in turn knew that the gas vans were constructed by the Technical Department of the RSHA (with their own collaboration) and so they approached Rauff if he can deliver such vehicle for Mauthausen. There was no gas van for Mauthausen available at the time, but Rauff knew from their collaboration that the KTI had previously obtained carbon monoxide gas bottles for Euthanasia killings. Therefore, he suggested the KTI to get such bottles for Mauthausen to bridge the time until the next batch of gas vans employing engine exhaust would be finished. In conclusion, the document looks authentic, it sounds authentic and it makes perfectly sense, while the forgery hypothesis doesn't, is not backed up by any evidence, explains nothing and has therefore no noticeable probative value. It seems to me the whole conspiracy gets more and more convoluted as Alvarez goes along. Why, for example, would anyone make up gas vans? It's an odd thing to dream up. Why not start and end with stationary gas chambers? For that matter, mass shootings is far easier, the only thing you have to account for is ammunition. No, clearly the evolution of killing techniques is there for all to see. The gas vans themselves were used in conjunction with the Einsatzgruppen. So, I really can't see the point of all of this twisting and squirming to make something fit a false narrative...,and, naturally, if all else fails, claim forgery.